Welcome to Bootstrapped Web, Episode 85. Brian has been busy traveling over the past month and is now settled in Asheville, NC for a few months. He gives an update on his participation in Brennan Dunn’s Double Your Freelancing conference last month. Also, Brian mentioned on this episode that tickets are still available for (both) Big Snow Tiny Confs… Well the Vermont trip is now sold out. But as of this writing (Oct 1, 2015), the Colorado trip still has a few spots open. Join us here: http://bigsnowtinyconfwest.com. So after some conference talk, today we get down to updating what’s going on in our businesses. 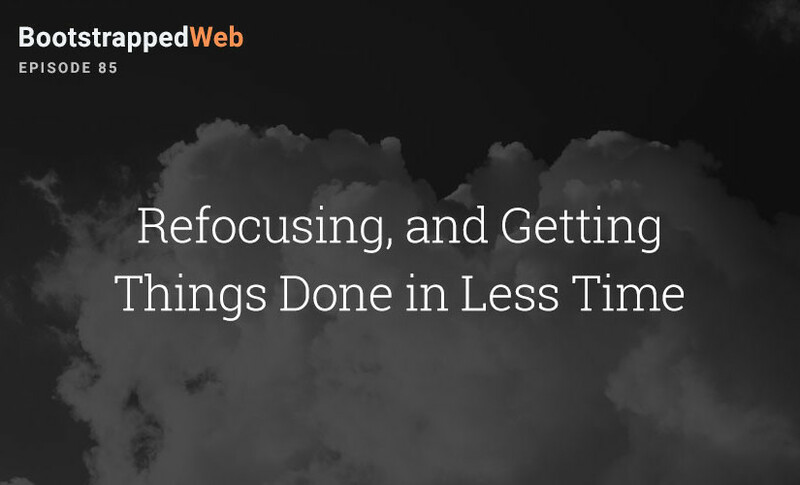 We also talk about the idea of finding ways to get more done in fewer hours. While our schedules are opposite in the times we are the most effective in our work, we realize that allowing ourselves to not feel guilty about the times our energy is focused elsewhere is an important goal.